Vacation Planning to Fernando de Noronha, Brazil. Recife & Porto de Galinhas or Natal with Fortaleza? 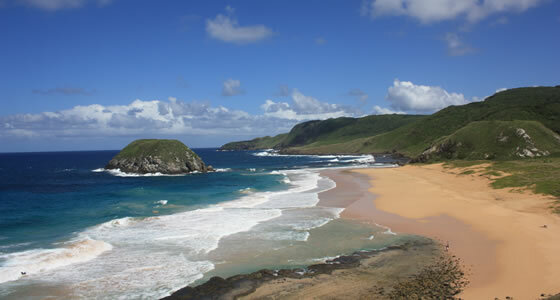 Combining your visit to Fernando de Noronha with other beach resorts in the Brazilian cost is a smart idea. Your sun tan will thank you for a long time. Natal, Fortaleza, Recife, Salvador have something in common: white sand beaches bathed by the sun all year round. Best Time to Visit Fernando de Noronha. The tourist spree through Brazil’s paradise starts from middle of December through February end. The climate revolves around two well differentiated seasons –the rainy season and the dry season. You can plan your visit based on your interests. Surfers can surf best between December and March. Rough waters observed during January make it the best month for surfers however these months are unsuitable for swimmers. Scuba diving proposals are excellent from August to November in the northern Mar de Dentro and from January to March in the South coast of Mar de Fora. Calmer seas make September and October ideal for diving. What’s your life style? In Noronha Islands, be an Islander. The people of Fernando de Noronha are a simple easy going folk. They take pride in calling the world’s most beautiful beach their home town. Today, around two thousand one hundred inhabitants and two hundred daily visitors on average are found on the islands at any given period. Maximum tourist numbers allowed are 420, including you. Hard not to feel Special, right?